In a country where multiculturalism has a reverent following and criticism of protected minorities has essentially been criminalized as “hate speech,” it is more than ironic that on some Canadian campuses radical students have taken it upon themselves to target one group, Jewish students, with a hatred that is nominally forbidden for any others. 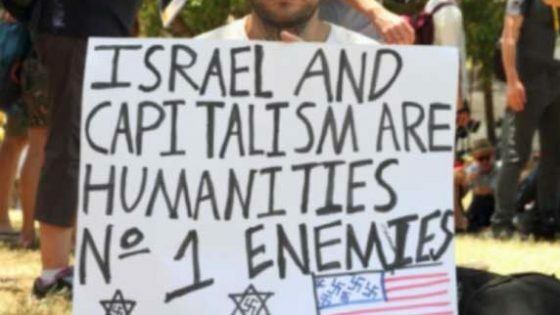 And with a recent incident that took place at the beginning of February, York University in particular, has now revealed a troubling pattern of tolerating physical and emotional assaults by pro-Palestinian radicals against Jewish students and others who dare to demonstrate any support for Israel or question the tactics of Islamists in their efforts to destroy the Jewish state. At a February 1st event, Hasbara Fellowships at York University, with the permission of the University, had set up a table to inform interested students about Hezbollah-kidnapped Israeli soldier Gilad Shalit as part of Hasbara’s ongoing campaign called “Free Palestinians from Hamas.” Typically, York’s outspoken and volatile pro-Palestinian students were less than willing to let such benign sentiments be aired, and, according to Hasbara’s co-president, Tyler Golden, demonstrated their displeasure by surrounding the table in an angry mob of some 50 activists, spewing forth anti-Semitic and anti-Israel slurs at the Jewish students. “At around 4 o’clock,” said Golden, “several known anti-Israel faces on campus came to start questioning us and debate with us… Security has asked us, when we come across this type of situation, to call them, which we did. We also videotape so they can see the faces and hear the voices of the people that do it. A few students who were surrounding us were upset that there were cameras in their faces, so they started yelling and screaming. As they were trying to push the cameras out of the way, they actually hit two of our students.” Muslin student groups have consistently attempted to disrupt the speeches of guests whose view are considered “unacceptable” because they might cause discomfort or “intimidation” for students unwilling to face the reality of radical Islam and unable to see any villain in the Middle East except Israel. And the recent brawling at York University is not the first instance of anti-Israelism gone amuck on that campus. York’s radicalized students had already revealed a rabid anti-Semitic leaning, when in February 2009, some 100 pro-Palestinian students initiated a near-riot, as police had to be called to usher Jewish students to safety after they had been barricaded inside the Hillel offices and were “isolated and threatened” by the physically and verbally aggressive demonstrators. Violence, and threats of violence, against Jewish students during conversations about Israel have occurred at other Canadian universities, as well. At the University of Toronto’s invidious 2009 Israeli Apartheid Week, for instance, the annual event had so devolved into a racist, rabid rally that proceedings were closed to cameras and reporters, and individuals who actually attempted to participate in a dialogue about the issues being raised by the noxious event in the first place were confronted with physical intimidation and threats, encountering the dark side of pro-Palestinianism. One of these individuals, Isaac Apter, a Jewish alumnus of the University of Toronto, recounted how he and others in the audience of one evening’s events quizzed a speaker about why Hamas had persistently refused to recognize the legitimacy of Israel-did “Israel have the right to exist?”-and when the speaker side-stepped the questioning repeatedly, some audience members shouted out, “Answer the questions!” Apter found himself approached from behind by a member of a private guard retained by Students Against Israel Apartheid, slapped in the head, yanked from his seat, and yelled at with the warning, “You shut the f-k up!” A second Jewish attendee was similarly assaulted that night by one of the hired security team and given a far more chilling warning, particularly in light of the barbaric practice of beheadings in the Middle East: “Shut the f-k up or I’ll saw your head off.” Not only was the Jewish state being attacked and degraded throughout these events, but now Jews themselves were being targeted for emotional and physical assault, an unsurprising outcome of a prolonged, virulent campaign against the concept of Israel as a Jewish state. University officials regularly proclaim, as they did when they had to defend sponsoring Israeli Apartheid Week, that they have a “commitment to the principles of freedom of inquiry, freedom of speech and freedom of association.” But that empty exhortation has shown itself, repeatedly, to be, at best, disingenuous, and, at worst, a masking of their true intention: enabling favored victim groups to utter vitriol and libel against Israel and Jews, with the pretense that they have somehow encouraged intellectual debate and productive political discussion. This is not scholarship at all; it is Jew-hatred dressed up in academic clothes.